12/02/2019 - H.E. 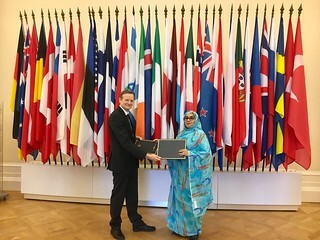 Aichetou Mint M’Haiham, Ambassador of Mauritania to France, signs the Convention in the presence of the OECD Deputy Secretary-General Ludger Schuknecht. Since 2009, the G20 has consistently encouraged countries to sign the Convention including most recently at the G20 summit in Buenos Aires in 2018 where the communique stated "All jurisdictions should sign and ratify the multilateral Convention on Mutual Administrative Assistance in Tax Matters." 127 jurisdictions currently participate in the Convention, including 17 jurisdictions covered by territorial extension*. This represents a wide range of countries including all G20 countries, all BRIICS, all OECD countries, major financial centres and an increasing number of developing countries. *In May 2018, the People's Republic of China extended the territorial scope of the Convention to the Hong Kong and Macau Special Administrative Regions pursuant to Article 29. As such, The Convention entered into force for both Hong Kong (China) and Macau (China) on 1 September 2018.